StarCraft II: Heart of the Swarm is a mutated beast of last year's real-time strategy game infused with traces of point and click adventure. For StarCraft II's first expansion, the second chapter in Blizzard's trilogy, the game is getting a dose of role-playing game elements. The evolutionary leap in Heart of the Swarm focuses on Sarah Kerrigan, the Terran Ghost turned Zerg Queen of Blades turned... well, we're not exactly sure what happened to Kerrigan after the final moments of Wings of Liberty. But she plays a major, starring role in Heart of the Swarm, changing the way StarCraft campaigns play. In fact, Kerrigan will serve as a "hero" character—a la Warcraft III—throughout Heart of the Swarm's single-player campaign, which we recently tested at Blizzard Entertainment. She'll be engaged in "almost every battle" in Heart of the Swarm. Unlike StarCraft's other hero characters, however, if Kerrigan dies on the battlefield, no sweat. She can come back to life, so be aggressive, Blizzard says. Blizzard's two mission-long demo was plucked from the "early-middle of the experience" of Heart of the Swarm, "maybe four to six missions" into the approximately 20 mission-long campaign, according to StarCraft II designer Dustin Browder. We're not sure how we got from the end of Wings of Liberty to here, but Kerrigan is now "embracing the Zerg." She's in command of her Zerg-controlling powers, driven to reclaim the splintered swarm, which is now in hiding and hunted by Terrans and Protoss after the events of Wings of Liberty. Inserted into the narrative at this stage elicits more questions than answers. "Why would she be fighting with [the Zerg]again? What happened to her after Jim carried her into the sunset?" Browder teases. Browder explained Kerrigan's state of mind in Heart of the Swarm and how she differs from the protagonist of the original game. "Kerrigan is the monster goddess of the Zerg," Browder said. "She has problems that Jim Raynor could never even dream of. Raynor's a great guy, he's got one ship, maybe a small fleet. If he worked real hard, he might be able to give Mengsk a bad day." "On his best day, with an alien artifact and a whole army behind him, he might able to take out the Queen of Blades," he continues. "But Kerrigan controls this huge swarm of monsters, maybe one third of the power of the entire Koprulu Sector." Kerrigan, Browder says, bears "a sort of responsibility and terror" in her mission. While she appears composed and vengeful, Kerrigan is also amnesic and unsure of her place in discussions with her Zerg subordinates. Rather than have Kerrigan discuss her motivations to reform the Zerg with Cerebrates or an unusually chatty Hydralisk—or simply rely on monologue—she'll command, confide in and seek advice from two unique brood members, Abathur and Izsha. Izsha serves as advisor, "the memory of [Kerrigan]as the Queen of Blades," she says. She's a female serpentine creature with pair of vestigial, humanoid arms, mostly Zerg, but vaguely human. Aboard the Leviathan, Izsha will provide battle insight and intelligence to Kerrigan. Abathur is Kerrigan's evolution master. A slimy, sinister blend of caterpillar and spider, according to Blizzard artist Sam Didier, he'll oversee the development of new strains of Zerg. Bring Abathur collected DNA strands and he'll reinforce Kerrigan's brood with stronger units and genetic offshoots. Players will interact with the pair on planet surfaces, while still in the Leviathan. It's not unlike the late game portion of Wings of Liberty, when Jim Raynor touched down on the planet Char. Kerrigan will also interact with her environment. In one segment, she looked at a Terran structure in the distance, vocalizing her hatred of Terran General Warfield from afar. In Wings of Liberty, Jim Raynor and his Terran forces had the benefit of the battlecruiser Hyperion's Armory and the Laboratory, where new units and upgrades unlock. Heart of the Swarm has its own rough equivalent of the armory, the Evolution Chamber, which Abathur oversees. In the Evolution Chamber, players can spend mutagens collected during missions on unit upgrades. In the limited demo Blizzard offered, I could upgrade a small group of available Zerg units, like the Zergling, making it run faster or spawn instantly from larvae; or the Roach, giving that unit increased armour and the ability to regenerate health faster while burrowed. 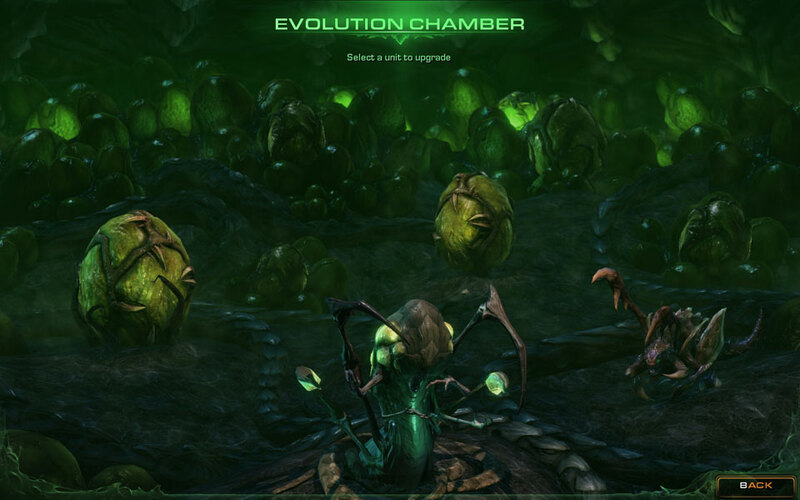 Beyond those upgrades, the Evolution Chamber also offers players the option to evolve their Zerglings, Banelings, Roaches and other units into different substrains of each species. With enough mutagen points, Banelings, for example, could ultimately be upgraded into Splitterlings (which split into two smaller Banelings upon death) or Gorgelings (which can reduce killed units and structures to collectible resources). 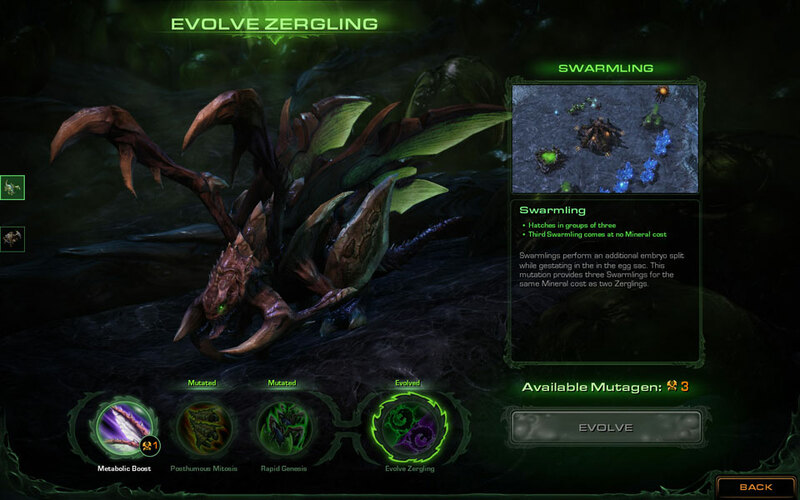 Zerglings can become Swarmlings or Raptors, Roaches spinning off Prowlers and Leeches. These evolutionary spin-offs are single-player only units—as far as we know, Blizzard's not revealing multiplayer changes yet—giving campaign players a larger unit spread, similar to what Wings of Liberty's campaign offered. As in Wings of Liberty, once players upgrade and evolve, there's no going back. You'll tailor your Zerg swarm to your personal preferences, resulting in "a swarm that looks fundamentally different from someone else's," according to Dustin Browder. Like the armory, Abathur's Evolution Chamber will visualize the make up of your Zerg brood. Every creature players unlock and acquire will appear in the background. The Zerg queen can also evolve her own abilities through the use of collectible DNA strands. 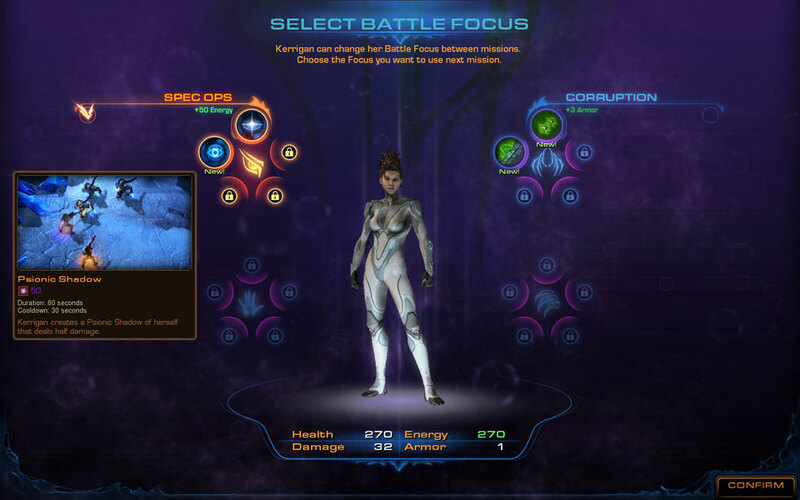 Players can effectively choose one of four available classes, or "Battle Focus," for Kerrigan when sending her into the battlefield, each with its own unique special abilities. Battle Focus also has an impact on Kerrigan's key stats: health, damage, energy, and armour. Two Battle Focuses were available in our demo, Spec Ops and Corruption. The Spec Ops version of Kerrigan granted her a +50 energy stat as a base, giving her the ability to cast Psionic Shadow (a duplicate of herself that deals half damage) and Pulse (which deals light damage to all targets in the area of effect, stunning them for three seconds). Corruption Kerrigan can cast Spawn Broodlings, which instantly kills a target and spawns five Broodlings from its corpse, and Corrosive Spores, an acidic attack that deals damage to a target area. During the limited demo, we unlocked one new Spec Ops skill, Infested Cortex, granting Kerrigan an additional energy boost. With five skills per Battle Focus and four Focuses, there appears to be a solid variety of play styles in Heart of the Swarm. I took both variants of Kerrigan into battle, trying out each multiple times. The Terrans, under the command of Warfield, have taken control of Char and begin systematically exterminating the leaderless Zerg broods. But one rogue brood under the control of the Zerg Queen Za'gara thrives and challenges Kerrigan's authority. After all, Kerrigan looks human, a species weaker than the whole of the Zerg swarm. The mission, "War for the Brood," sends Kerrigan and her limited forces to absorb the brood by collecting 100 Zerg eggs—before Za'gara can do the same. When the mission starts, this section of Char is overrun with feral Zerg that will attack Kerrigan. She must reclaim eggs sacs scattered around the map while fending off Za'gara's brood. She'll also face Za'gara herself, who like Kerrigan can resurrect her corporeal form even if she's killed. 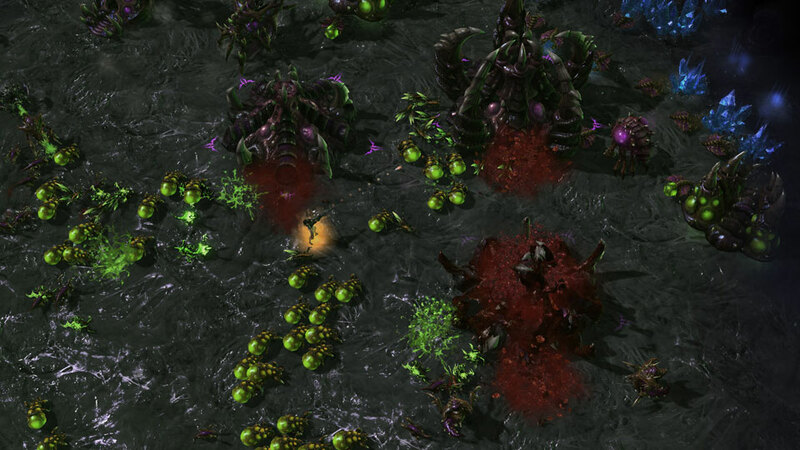 Players also have the option of collecting Baneling eggs as a mission bonus and DNA enhancements for Kerrigan herself. Kerrigan is limited to building Zerglings and Banelings during "War for the Brood," an army perfectly capable of defeating Za'gara's weakened brood. The mission pays off with the player given hundreds of Banelings and Zerglings that spawn instantly in a huge birthing pool, leading to a crushing invasion of Za'gara's base. Ultimately, the rogue Queen relents and offers Kerrigan her allegiance. Kaldir is a new destination for StarCraft II players, an icy planet on which the Na'fash Zerg brood has taken shelter to rebuild its numbers. This frozen wasteland presents a new challenge for Kerrigan and her small band of Zerglings and Roaches. Kaldir's icy winds will routinely freeze the small Zerg army, leaving them vulnerable. That is, until Abathur offers Kerrigan a solution. Kaldir is populated with Yetis. Yes, Yetis. Should Kerrigan kill enough of them and extract their DNA, the Zerg can be mutated to adapt to the cold weather. They're not much of a challenge, with the exception of the much larger Yeti Matriarchs, but they do represent a threat. The Yeti of Kaldir are a separate and opposing force. They'll attack Kerrigan's camp randomly. But they'll also attack the Protoss bases that exist on Kaldir. Even better, those frozen winds also have a similarly detrimental effect on the Protoss, freezing them in place when the icy environmental effects kick in. Like the rising lava on Char or the nighttime terrors of Meinhoff, players will have to be mindful of Kaldir's cyclical winds. The first mission on Kaldir, "Silence Their Cries," has Kerrigan and her brood destroying a trio of Protoss Psi-Spires to prevent the Protoss on Kaldir from communicating details to their homeworld about the Zerg revival. There's little resistance and with the aid of the planet's freezing winds, cutting through the scattered Protoss bases was simple and enjoyable. *** My hands on time with StarCraft II: Heart of the Swarm was just a small slice of what Blizzard is planning for the first expansion for StarCraft II. Blizzard is promising new multiplayer components in the form of new units and maps, as well as changes to its Battle.net service, with one primary focus being the StarCraft Marketplace. Blizzard has not dated StarCraft II: Heart of the Swarm yet, but the game is currently planned for a PC and Mac release. It will be "price[d]accordingly" as an expansion for StarCraft II, the company says. 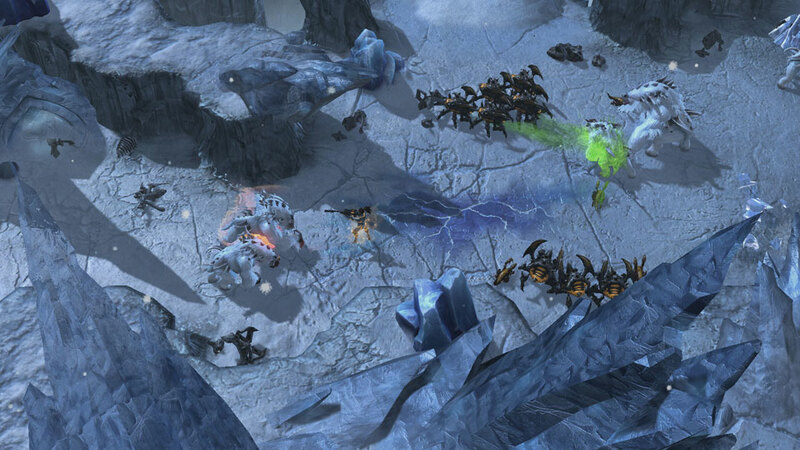 We'll have more from StarCraft II: Heart of the Swarm at BlizzCon later this year. since we are seeing all of this now, safe to say june 2012 release? Wait, so Zerg can survive space, but not a cool breeze? Im scared and excited at the same time. The hero system might help the satiate my hunger for Warcraft IV. what do u mean currently PLANNED for a PC and mac release? They wont release this consoles for sure coz 1). Its an expansion pack 2). SC2 wont work on consoles. So it should be a 'will be released'. And it is definitely going to be released. Console fanboy much Mr. McWhertor? I think you're jumping to conclusions, Jay. As Michael stated, the game is currently planned for both PC and Mac release, albeit without a confirmed date. Michael did not mention anything about a release on any other medium at all. I don't think you need to worry about Starcraft 'jumping ship', nor is Michael insinuating that it will. Oh, hey, it's Blizzard. Got any LAN in that bag, Blizzard? This game is not balanced of L(e)AN.